Playing out in many families in America seems to be some sort of crisis, or at least a dysfunction. 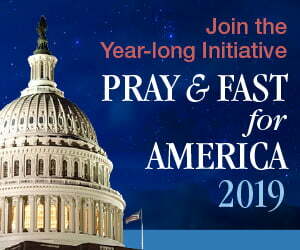 What we are witnessing today is the manifestation of several generations of Americans with at least half the population trying to push a world-view, which voids the presence of God. The fruit of that thinking is what we are watching today in real time on television, schoolrooms, and all forms of media. At the 2012 Democratic National Convention in Charlotte, North Carolina, when God was brought up as a party platform, more than half of the capacity filled arena booed God off stage. The Illinois State Senate recently passed a bill legalizing medical marijuana on the grounds of elementary and middle school ground. One doesn’t need to be a PhD in sociology to see where this is headed. All that is needed for the bill to become law is the signature of the governor. Common sense is not commonly found. Everything seems to be percolating towards an event. What that is no one seems to know for sure, but nonetheless, people are anxious. It is now obvious the baby boomers have lived beyond their means with a Federal Reserve that prints money out of thin air enabling a life style in its twilight. But, the battle inside the family and what constitutes a family is larger than all other battles put together. Why? When a family loses its moral structure, everything important is lost. Sociologists and historians agree an intact nuclear family is the glue of all societies. The rock of all civilization is a strong family. Studies have clearly shown that strong marriages create emotionally healthy motivated children who grow up to become well-adjusted adults who themselves marry and have strong families. If Satan wanted to destroy all of mankind, it would make sense that he would go to the heart of God’s creation. Under the guidance of Saint John Paul II, the Church saw the establishment of the Pontifical Institute for the Studies on Marriage and the Family. Pope John Paul II said marriage was the bedrock of civilization, expressing these views early in his pontificate with his writings on The Theology of the Body. This was an area where he had primary interest since his canoe and camping trips with youth while a young priest in Poland. Cardinal Carlo Caffarra of Bologna was involved with this new Institute. Cardinal Caffara wrote Sister Lucy of Fatima asking for her prayers on the Institute not really expecting an answer back. Just prior to the woman clothed with the sun appearing is chaos in the world. As the Ark of the New Covenant, it will be the actions of Our Lady that crush the head of the serpent. Sister Lucy is saying it is a fait d’accompli – it is already done. The chaos we are seeing around us shows that Satan knows his time is short and is doing everything possible to disrupt God’s creation. Even in previous pagan civilizations, homosexuality was never seen as normal behavior. However, we see an assault like never before through every social medium available to normalize this behavior. Looking back, Humanae Vitae was prophetic when one looks at the abuse to natural law alone. A seasoned OB/GYN will tell you what happens before a birth. First, the woman just wants to birth the child and be done with it. After nine beautiful months, she is ready and wants to give birth. Second, the woman about to give birth is in extreme discomfort. The pain is excruciating with the birth pangs. Pangs of birth where the pain of delivery confirms the sin of Adam, “Woman will have pain in childbirth.” Third, while a woman is pushing and grunting, she may wonder if she could die. There is a fear of death that she may not be able to accomplish this. She is the only one who can see this through. There is often yelling, screaming, apprehension, and exhaustion. When the child is born, it is as if the pain was never there. It is forgotten as she holds her newborn. In a moment, the agony turns to ecstasy. We are presently witnessing the dawn and birth of a New Era, The New Times, The Fullness of Time, a New Jerusalem, or as Saint John Paul II said, a New Springtime, with the attendant pain prior to a birth of a child. The confusion and lack of discipline we see in the Church and culture today is systemic chaos. Before the child arrives is a time of uncertainty and normal human anxiety because the old and familiar is being swept away, and the new is on the horizon. Major prophecy and church approved apparitions sites are pointing to this. Cardinal Raymond Burke and several other leading cardinals and bishops have said there are many events pointing to the fact that we may be living in the days spoken of in Scripture. The Blessed Mother is saying those proclaiming the Word of God are now the Apostles of the Last Times. Saint Louis de Montfort said it will be Marian lay people who will carry the Church through the challenges it faces. Has any battle ever been bigger? This was said over forty years ago, and it appears the confluence of events has risen to a fever pitch with Satan knowing his time is short. Thus we see the pain around us. In the Church we see a progressive element seeking to change the words of Jesus on marriage and family based upon the gospel narrative. Moses under pressure from the people softened and watered down this issue as well while the chosen Hebrew people slowly marched into the land of milk and honey complaining about this teaching of Yahweh while in the desert. Jesus cleared this up in Matthew 19 and Mark 10. What was supposed to be an 11-day journey, took 40 years due to disobedience. Scripture is not gray on these subjects and all the spin and Google analytics manipulation in the world can’t change the words of Jesus. This is the battle of all battles in our midst — marriage and family. 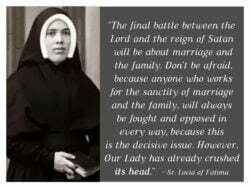 Sister Lucia dos Santos of Fatima articulated her prophetic utterance on what we would see for these times and she was correct. To end on a hopeful note: If you are looking to turn things around, start with the most basic of all by keeping the Sabbath Holy. Keep Sunday for worship, rest, family meals, and no manual labor if possible; Sunday was not designed by God as a day for running errands.